When it arrives in Detroit on January 13, 2013, the new 2014 Corvette will have a new heart. The seventh generation Vette, nicknamed C7, will be powered by a V8 code named LT1, the first of General Motors’ new Gen V family of small block V8s. While some reports suggested displacement would drop to 5.5 liters, the LT1 will in fact displace 6.2 liters, just like the current Corvette C6’s engine. 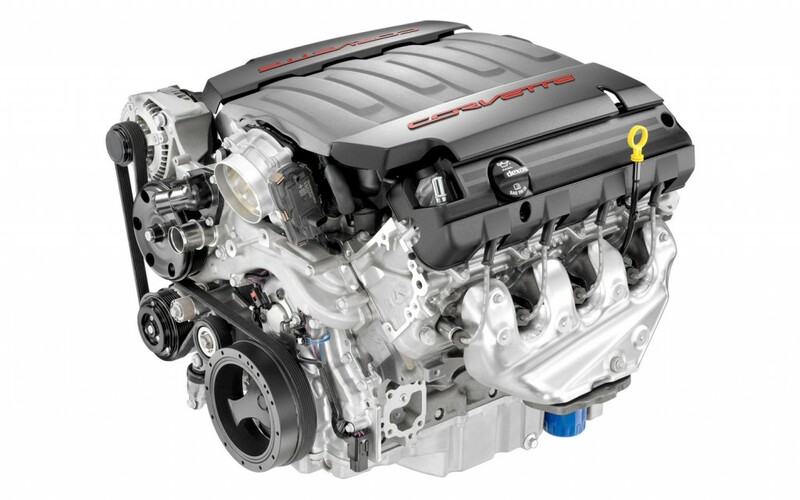 Chevy released a “preliminary” output figure of 450 horsepower and 450 pound-feet of torque. That’s 20 more horses and 26 more torques than the C6. Chevy says that power will make the C7 the quickest standard Corvette ever (Z06s and ZR1s are another matter), with a 0 to 60 mph time of under four seconds. At the same time, the C7 is also expected to be the most fuel efficient Corvette ever, achieving a ballpark 26 mpg highway. However, the power, performance, and fuel economy numbers could change before the C7 goes on sale next year. To achieve its new benchmarks, Chevy gave its small block V8, which has been in production in one form or another since 1955, an extensive redesign. The new LT1 small block brings several new technologies to the party. The C7 will be the first Corvette to have direct injection, which sprays a precise amount of fuel directly into the combustion chamber for a more efficient burn. Another Vette first is Active Fuel Management, GM’s name for cylinder deactivation, which shuts off four of the eight cylinders when less power is needed, to conserve fuel. Rounding off the new technology list is continuously variable valve timing, which varies the rhythm of the valves at different speeds to make the engine more efficient. Advancing it creates more torque, while retarding it increases mpg. All of these systems were fine-tuned with more than 10 million hours of computational analysis. Why did GM wait so long to adopt technologies that can be found in cheaper Fords and Hondas? Unlike most new cars, the Corvette does not have overhead valves, so getting the hardware for direct injection and variable valve timing onto the LT1 required a bit of a rethink. Also helping efficiency is a lighter aluminum block. Chevy says the LT1 is 40 pounds lighter than “a competitor’s twin-turbo 4.4-liter, DOHC V8 with similar output,” probably a reference to the engine BMW uses in the 5 Series, M5, and other models. The lighter block should also give the C7 an ideal 50/50 front/rear weight distribution, and an improved power-to-weight ratio. The 2014 LT1 is actually the third engine to bear that alphanumeric name; two previous versions were released in 1970 and 1992. The new LT1 will be built at GM’s Tonawanda, New York engine plant, while the rest of the Corvette will continue to be built in Bowling Green, Kentucky. The 2014 Corvette C7, and its new engine, will be unveiled on January 13, 2013 in Detroit.